Hundreds of people demonstrated against the Syrian government in the town of Jassem on Monday, activists said, as unrest spread in southern Syria. “They are staging a sit-in the center of the town,” one of the activists said. Thousands of Syrians marched Monday in the southern town of Daraa after the funeral of a protester killed in the previous day’s demonstration inspired by revolts in Tunisia and Egypt, a resident said. The resident said “a mass of demonstrators started to march from the cemetery towards Al-Omari mosque after the burial” of Raed Akrad, who was killed by security forces on Sunday when they used live ammunition to break up a protest. 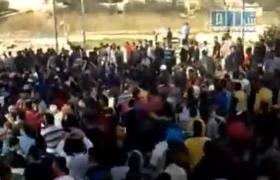 Deraa,a city in the Hauran region close to the border with Jordan, has seen the most sizable protests so far. But demonstrations have also taken place in Homs, Damascus and its environs, Der el Zor, the Kurdish city of Qamishli, Banias and Aleppo. The authorities have clearly been caught by surprise. President Bashar Assad, leader of one of the most repressive regimes on earth, had complacently explained in recent weeks that Syria would not be affected by the unrest sweeping the Arab world because the regime’s policies were in tune with popular sentiment. This contention has now been disproved. However, this does not mean that the demise of the Syrian regime is imminent. Nor does it mean that the sentiments of significant sections of the demonstrators differ from those of the regime in certain important areas – particularly regarding Israel and the West. As events in Deraa already illustrate, the Syrian regime is predictably willing to employ extreme force against its own people – up to and including live ammunition against protesters. This is not a sign of the regime’s strength, but rather, paradoxically, of its vulnerability. In Egypt and Tunisia, elements of the regime were able to enter into a certain dialogue with the protesters. Unpopular regime figureheads were replaced, while the military went on to steward the process of reform. In Syria, the regime has less room to maneuver. The Assad family dictatorship may count with some confidence on the support only of its fellow Alawites – around 12 percent of the population. The regime maintains its grip not through the seeking of legitimacy, but through the imposition of fear. Syria is an ally of Iran and for this reason the prospect of this regime employing extreme measures – should the protests continue and spread – is very real. The Assad regime has long sought to justify itself in the eyes of its people by depicting itself as Israel’s most staunch opponent, despite the fact that the Golan Heights remain occupied by Israel and since the 1973 War, not a shot has been fired between Israel and Syria in the Golan. This version has been in evidence among the protesters. A protest reported to have taken place near the town of Kuneitra on the Golan Heights saw protesters referring to Assad as a “traitor” who is “guarding the border of Israel.” An unnamed speaker claimed that the Syrian security services were supported by Israel. Sentiments of this kind are in line with the Muslim Brotherhood’s characterization of the regime as Israel’s “main protector.” According to this view, Assad’s maintaining of quiet on the Golan Heights is a mark of submission to Israel. Exiled Islamist leaders such as Sheikh Issam al-Attar have issued statements calling for an escalation of the demonstrations. So the protests look set to continue. The opposition currently believes that Assad is scared. Caught in the headlights. The Syrian dictator – who proved over the last half decade to be no less capable of cruelty and cunning than was his father – will be looking to dispel this sense in the days ahead.